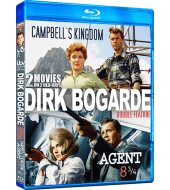 Campbell's Kingdom: Bruce Campbell (Dirk Bogarde) is a young Englishman who believes himself to be incurably ill. He travels to Canada to take up his grandfather's inheritance, Campbell's Kingdom, a valley high in the Rockies. Here he intends to spend the last few months of his life. When he arrives in Come Lucky, an old ghost town which has lost the prosperity of its gold rush days, he is greeted with hostility by the men in the "Golden Calf” saloon. Owen Morgan, a contractor for Henry Fergus, tells him that his grandfather's death ended a deadlock in Come Lucky. The old man, King Campbell, believed there was oil in the valley. Therefore, he prevented Morgan from completing a dam and flooding the valley as part of a new hydro-electric scheme which would bring back prosperity. Now, since mining surveyor Boy Bladen's (Michael Craig) report shows that there is no chance of oil being found there, the Government has given permission for the flooding. Campbell chooses to take up where his grandfather left off and discover oil before the mining company can flood the valley! 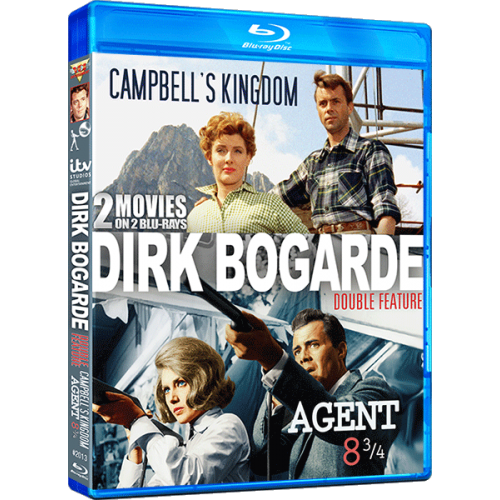 Agent 8 3/4: Dirk Bogarde, Sylva Koscina and Robert Morley star in this satirical comedy-thriller at the height of the 007 popularity and set amidst the world of international espionage. Unemployed Nicolas Whistler accepts a job and a tidy salary with what he believes to be a glass manufacturing company in London. He soon discovers that his business behind the Iron Curtain is in fact illegal. Everyone apparently believes him to be a spy but it takes much time and adventure for him to realize it. The realization numbs him with horror, and with his contacts gone, he is on his own. He must escape arrest and flee to England but the secret police are close behind him. Robert Morley, as his boss is a scene stealer!